Steve began singing and acting at a young age. At 14, he was gifted a guitar and was writing songs soon after. By age 17, he had recorded two albums out of his bedroom and racked up over 125,000 streams for his music on the at-the-time trendy social media site, Myspace. His early efforts were inspired by artists like Jason Mraz and Ben Folds. He started to find his soulful pop style while studying music at Xavier University in Cincinnati, Ohio. Many hours spent singing in choirs, studying classical piano and Bossa Nova guitar techniques and even composing music for choir and string orchestra helped give Steve’s music its eclectic sound. 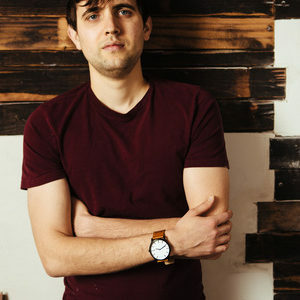 Mraz and Folds continued to have a strong influence on his music, but new artists such as Eric Hutchinson and Regina Spektor and classic greats like Elliott Smith and Billy Preston were added to the mix. After graduation, Steve moved back to the Indianapolis, Indiana area and began making a name for himself as a singer/songwriter on the local scene. On July 30th 2016, Steve released his debut full length album “Let’s Begin” with a full band performance at The Hi-Fi in Indy’s trendy Fountain Square district. Produced by Jonathan Class, the album rose to #3 on the NoiseTrade singer/songwriter charts. Singles off the album are now gaining circulation on FM radio, internet radio and music blogs worldwide. It’s a soulful, gospel sound tempered with a southern rock growl polished with a hot Chicago brass section and sweet vocal harmony. Norman’s voice reflects The Black Crowes’ Chris Robinson, and his honest, rock and soul music compliments his blue collar roots and disarming sense of humor. His band is a hand-picked all-star group of some of the finest players from the best groups in Chicago and around the country. His latest albums “Take it in Stride” and “Traveling Light” were among the top albums in Chicagoland (Tom Lounges, The Times). He went on to study at Wheaton Conservatory of Music, where he began composing and arranging pieces for orchestra, chorus, and jazz ensemble. He was also commissioned by Arena Theater, Northern Illinois University, and Workout Theater for scores to their theatrical productions including “A Midsummer Night’s Dream” and “The Madwoman of Chaillot.” He also has won multiple awards at the Elmhurst Jazz Festival, was a tenor in the Northwest Indiana Symphony, played Chicago’s largest independent music festival at the late Congress Theater, directed music at the largest RCA church in the world, and holds the all-time Wheaton College high score in the original Nintendo game Duck Hunt. S. Joel Norman has also played alongside jazz greats Ira Sullivan and Marquis Hill, as well as rock and roll heroes Billy Ozzello (Survivor) and Chip Znuff (Enuff Znuff), and went on the road playing keyboards with Eddie Money. He also enjoys cooking, learning how to speak pointless languages, and accepting any challengers in NES Tetris.